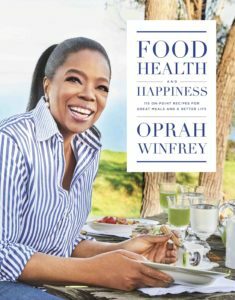 Oprah Winfrey’s new cookbook Food, Health and Happiness is filled with recipes she loves to share with friends and family. As well as a cookbook it is a memoir about Oprah’s own food journey and the many battles she has had with her weight. I found her childhood reminiscences touching. As a little girl she used to dream of a perfect world in which her mother would ladle up a great big bowl of Campbell’s soup just for her. But her Mother was a maid and after spending all day cleaning other people’s houses, tousling her braids and serving her daughter soup was out of the question. She continued to try every diet under the sun. Eventually it was the Weightwatchers programme which proved to be the most successful for her. At the time this book was published she had reached a stage where, having lost 40 kilos, she is content and feels comfortable with her body. On the basis of what she has learnt on her own often tortuous journey she is able to offer lots of advice and encouragement to others who want to lose weight. The recipes in Food, Health and Happiness were created for her by well-known American chefs who have worked for her over the years. Although it is not an official Weightwatchers cookbook at the end of each recipe the Weightwatchers Points are included. Oprah is closely involved with this organisation and is a part owner. I thought the recipes might be more suited to American palates but was pleased to find that most were in tune with the way we eat as well. Being chef’s recipes some did have a long list ingredients and took time to put together. But they were not too complicated. The Pasta Primavera made with heaps of vegetables (carrots, courgettes, broccoli, mushrooms and a yellow pepper) and only a small amount of pasta was lifted out of the ordinary by the basil chiffonade and a sprinkling of pinenuts. Couscous made by whizzing raw cauliflower in a food processor until it resembles grains has become a favourite amongst food bloggers lately. The version in Oprah’s cookbook in which the cauliflower grains are stir-fried with turmeric, garlic and cumin before the other ingredients are stirred in was very tasty. Her sorbets look delicious and as Oprah points out they contain zero fat. But several of them include 100 grams of unrefined white sugar which I thought was a lot so I didn’t try them. 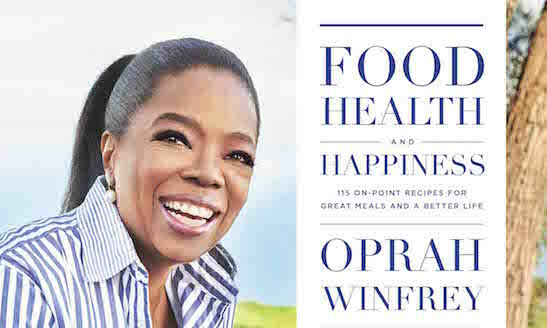 Oprah Winfrey’s new cookbook Food, Health and Happiness is already an Amazon bestseller. A great many adoring Oprah fans and Weightwatcher will have snapped it up. But anyone who is interested in living a healthy lifestyle will find some interesting recipes in Food Health and Happiness to choose from for weekday meals as well as celebratory occasions. I wrote this review in my weekly column in the GrownUps website https://www.grownups.co.nz/.